On this sunny morning, the Karmapa and his entourage drove down Kintzigstrasse in the former East Berlin to pay a visit to the Bodhicarya center, founded by Ringu Tulku Rinpoche. The wood fence lining the street outside the center is decorated with colorful drawings of the eight auspicious symbols, which lead up to the main gate. Its doors are opened wide to reveal a vista of the countryside hidden in this corner of Berlin. Winding paths lined with grasses and flowers wend their way past red brick, single-story buildings to the tall meditation hall at the back of the property. On top are special rooms for the Karmapa including a balcony with a view of the gardens and the surrounding area. Open to everyone from early in the morning to late at night, the center is full of activities from Tai Chi and many kinds of yoga to various levels of meditation, and even stupa building. The members of Bodhicharya engage in hospice work and also have hosted for the last ten years, work-study seminars for students from all over the world. The center engages in interreligious dialogue and also invites teachers of different Tibetan traditions to teach. 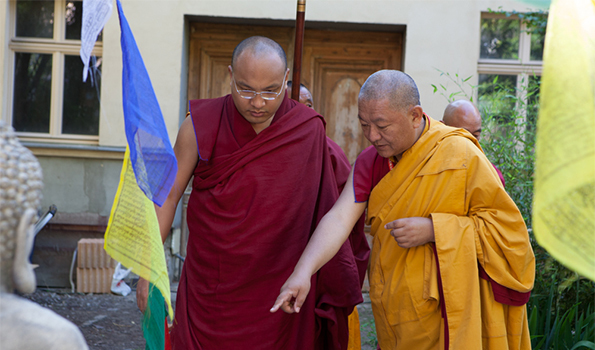 In line with the Karmapa’s deep interest in the environment, Bodhicharya is involved with protecting it and was one of five places selected for the research program, Urban Strategies for Climate Change. As a contribution to the neighborhood, the center built a playground for children. The programs at Bodhicharya are run completely on dana (offerings), so to support itself, the center rents out eight small apartments as well as renting out larger spaces for a variety of classes. When the Karmapa came to this center of spiritual and social activity, he first stopped at a large circle of white stones surrounded by gardens so that he could bless this site for a six-meter tall stupa and lay its first building stone. He then entered the two-story open space of the main shrine hall, where the members of the community and specially invited guests waited for him. Ringu Tulku Rinpoche welcomed him, saying, “It has been our wish and long waiting that His Holiness the Karmapa could visit this place. It was built for you, and we are in the process of adding some rooms for you, so that hopefully during the next visit you could stay here. Ringu Tulku Rinpoche closed with a request for the Karmapa to bless and give them guidance, to really take over this place and make it useful for many people in the future. The monk Tendzin then read out a formal request to His Holiness, asking him “ to be the head of our center. Until we attain enlightenment, may we help you in the Buddha activity that you are predicted to perform for all the beings in the world.” Tenzin then offered the Karmapa a large, symbolic golden key to the center. 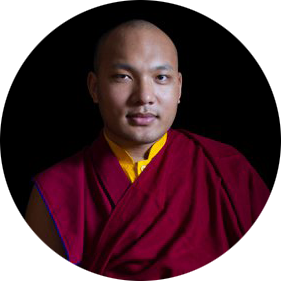 The Karmapa responded that the Karma Kamtsang seems to have a special connection with Europe. “From my information, when Tibetan Buddhism first came to the West, especially to Europe, the masters who established it here seem to be more from the Karma Kamtsang tradition, so there’s a special karmic relationship between us. “In the Tibetan Buddhist tradition, all the different vehicles are practiced and studied, so it preserves a very complete and inclusive practice of Buddhism. Usually, we think of the Tibetan tradition as being divided between the Nyingma, Kagyu, Geluk, and Sakya. But actually, it’s not like that. When we consider the individual lineages that the lamas transmit and their main seats, these are varied; however, ultimately they are not different. They are all the Buddha’s teachings and should be practiced. Turning to English, The Karmapa cautioned, “When we first become followers of Tibetan Buddhism, some lamas will tell us, ‘You belong to this lineage.’ They want us to have a strong sense that we are a follower of such and such lineage. They teach a kind of fundamentalism. Actually, a good lama should teach you how to practice, how to be a good person, to generate compassion and love. Fundamentalism is not good, and that’s why here in this center, Rinpoche invites lots of masters from different traditions and lineages. This is a great opportunity for all of you. In Tibetan society sometimes we didn’t have this opportunity; we only connected with the lamas who belonged to our lineage. I think it is very important to invite masters from other traditions.